This entry was posted on October 23, 2017 by wallst_greet. You asked, we listened. Our Premium Card Line continues to get better. 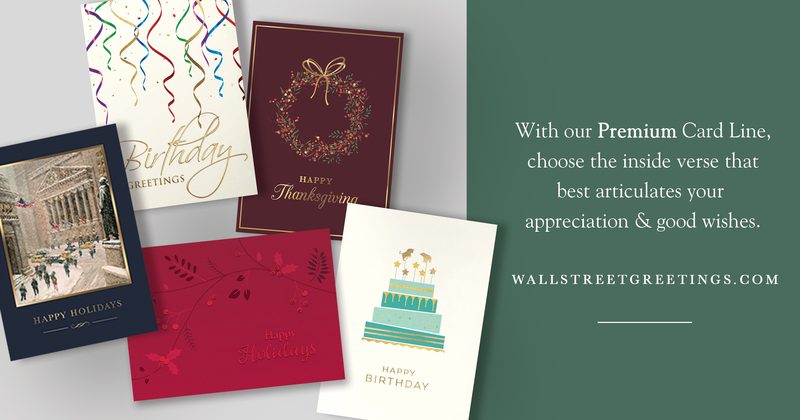 This holiday season you can choose an inside verse for your business greeting cards from Wall Street Greetings. Select from a variety of sentiments. Choose a message that best fits your personal brand and conveys your sincere holiday wishes. Available on Premium Thanksgiving and Holiday designs, priced as low as $1.19 with quantity and corporate discounts. Choose from a mix of clever financial-themed holiday greetings, tasteful expressions of gratitude or "Merry Christmas" wishes; our cards and sentiments are sure to delight.